November 2 is All Soul's day for Christians. Its the day that we remember the souls in Purgatory as well as visit the graves of our relatives. In the spirit of the season I'd like to pay tribute to one very dear character in the Macross franchise who had passed away, Roy Focker. What endeared Roy Focker to the fans, aside from being an Ace pilot, was that he was Senpai (mentor) to Hikaru Ichijo and Shin Kudo. He had as his coat of arms the Skull and Crossbones, hence also why his personal squadron was named the Skull Squadron. He was a gifted leader, having been made commander of the Variable Fighter wing of the SDF-1. He wasn't perfect man though, he was a flirt and a drunkard but the pluses made up more for the minuses. Despite those shortcomings he was loyal to his friends and to Claudia LaSalle, the last girl he had a relationship with. Although it was very sad that he died, it was a necessary step in the development of plotline so that the main protagonist, Hikaru Ichijo, would finally grow up and mature without his Senpai around to guide him. 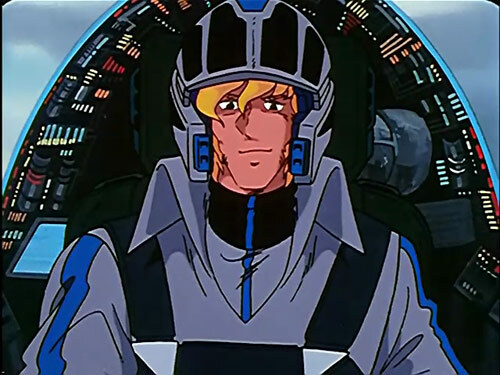 In the Original Macross series, Roy Focker died via a lucky shot from a Meltrandi Quadluun Rau pilot who was in Milia Fallyna's squadron. This was on the day that she went out with her squadron to hunt down her future husband, Maximillian Jenius for being a better pilot than her after being ribbed by Quamzin about it. Prior to his being shot, Claudia LaSalle offered to make him some Pineapple Salad on his return home. That is also the reason why whenever the offer of pineapple is being made in an episode of Macross fans shudder with fear that recipient might be killed off. In the Macross: Do You Remember Love? movie adaptation, he died fighting off the Zentradi who were pursuing them so that Misa and Hikaru could escape. Roy Focker got to know Hikaru Ichijo after he had worked at Hikaru's father's acrobatic air show business. It was also due to this prior personal relationship that Hikaru got invited by Roy Focker to attend the launching of the SDF-1 and set the scene as to how Hikaru ended up on the Macross. He was the one who convinced Hikaru to sign up for the military to help defend the SDF-1 as it tried to find its way back home to earth. Along the way he continued guiding the young man in his military career, from a rookie pilot to eventually leader of his own flight team. It was also because of this close relationship, almost like family even, that it was apt that Hikaru Ichijo inherited Roy's beloved VF-1S and the famed Skull Squadron after his death. In the Macross Zero series, that preceded all the other Macross Series in terms of timeline, we found out that Roy loved flying but abhorred war. It was only due to the death of his friend Michael in a bombing incident that he signed up with the military to fight. 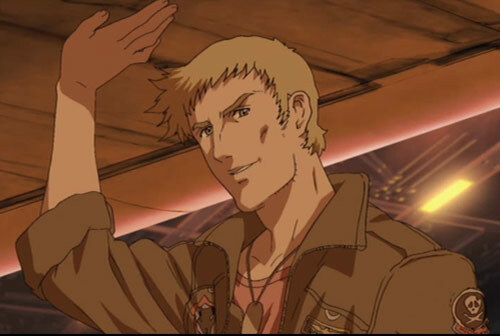 The Macross Frontier Series paid homage to Roy Focker by modeling SMS Skull Squadron Leader, Ozma Lee, after him. The only difference this time was that he didn't die after being offered some pineapple cake. In real life, Roy Focker was voiced by Seiyuu actor Akira Kamiya. Aside from Roy Focker, the other notable character he voiced was Ryo Nagare from the Getter Series.